The finish of the New Zealand half of the series saw the Bruce McLaren Racing Team in a commanding position. McLaren won three of the races and Brabham's back-up man, Denny Hulme, won the fourth. Although the New Zealanders took the silverware, the Australians were there snapping, waiting for the slightest mistake, to which the polished drivers are not unduly prone. Sandown Park in Victoria was the first race of the Australian half of the championship, on February 9th 1964, and this year was awarded the Australian Grand Prix, the premier event on the CAMS racing calendar. From start to finish it was a long drawn out four day affair. On Thursday there was an unofficial practice session with a few of the locals and visiting drivers pottering around the 1.9 mile track improving handling, modifying suspensions and changing gear ratios. For the first official practice session on the Friday afternoon all of the 2.5 litre competitors turned up, with the exception of New Zealander Tony Shelly who was wandering around the pits very dejectedly. The Lola which Chris Amon had used in New Zealand and which Shelly subsequently bought, was still awaiting a Melbourne wharfie's sling in the hold of a cargo ship. Undecided rainy weather earlier had wet the track and when Mayer and McLaren slipped on their amazing small stressed-skin Coopers the circuit was still quite damp in several places. Both settled down quickly after surveying the track and McLaren, after circulating consistently, turned in a sizzler at 1:9:7, which eventually proved to be the fastest time of the day. Mayer went well for a driver that had never set eyes on the track before and turned in a 1:10:7, but was a little worried about a small stress fracture which appeared on one of the rear wishbones. Mayer at his first appearance in Australia. Frank Matich then began to move and before the pinion gear in the VW-based gearbox sheared, he recorded 1:10:1 and found himself fastest of the locals, with Stillwell, using a short-stroke Climax motor, a full second behind. Tasmanian John Youl, had gearbox troubles and was a little worried about the twin plug head motor which he felt was down on power, it had done five races and associated heats in New Zealand, and had not been overhauled, save for tuning. Bill Patterson, sporting the ex-Stillwell, ex-Brabham Cooper, gave a fiery display and not without cause, turning in a lap of 1:11:6. Driving Patterson's other, older Cooper, veteran Doug Whiteford, who came out of retirement for the race, was 2.9 seconds slower. Brabham appeared, recorded a very non-chalant 1:10:5 before a driveshaft gave up near Shell corner and the car wheeled back to the pits, where it was hastily loaded on to a trailer and taken to Repco Research, where technicians and engineers worked all night to turn up a new shaft. Hulme, although slightly faster than The Master in this session, was having a few troubles with the oil system, apparently the pressure was abnormally low. Jim Palmer, from Hamilton in New Zealand, was having power troubles in his car, the Cooper that Angus Hyslop had used with some success for several years. Lex Davison turned in a 1:11:5 in the car McLaren used on his Australasian tour last year. The pre-race and practice forecasts of a hotly contested under 1500cc section were completely right and Leo Geoghegan (Lotus 27 pushrod 109E Ford) and Frank Gardner (Brabham-Ford twin cam) immediately assumed command, both with very quick times. Geoghegan, with 1:14:7, bettered Gardner's time by 0.1 sec. All of the rest of the 1500cc contingent improved their times on Saturday. During the official half hour session on Saturday, Brabham won the 100 bottles of champagne for the fastest practice time when he recorded 1:9:6 to take pole position. Matich, who was having transmission problems, failed to make the greater part of the half-hour session and later in the day several drivers asked the organisers for another official practice session. After some deliberation the promoters agreed and six cars took to the track. None of them, however, improved their times. After the final session the grid jelled with a front row of Brabham, McLaren and Matich. They were followed by Hulme and Mayer, then Davison, Stillwell and Patterson, then Youl and Shelly, then Palmer, Whiteford and Geoghegan, then Gardner and Scott, then Glass, Walker and Rilstone, then Hunnam and Smith, then McEwin, Osborne and Fletcher, with Mitchell at the rear. Race day seemed to be ideal weather for a very fast race. Just before race time, the drivers and crews wheeled their cars down to the grid and when the whole entourage was assembled, there was a gaping hole in the middle of the front row and McLaren was posted missing. Apparently he split a seam on the radiator when the car bottomed on the concrete warm-up road. The car was hustled back to the pits where mechanics pulled out the unit and soldered up the offending part, replacing all within 15 minutes. McLaren joined the grid after motoring around the back of the circuit, just before the field was sent away on its warming-up lap. Mechanics working on McLaren's punctured radiator. As the starter dropped the flag, Matich and Brabham surged away but were quickly caught by McLaren, who really got into the swing of things in second gear and disappeared into Shell corner well ahead of anyone else. Matich followed him through with Davison, who made a simply superb start, hot on his heels. When Matich slowed suddenly in the corner Davison threw his car sideways to avoid an accident and was back to last place before he had fully sorted the situation. As they flashed past the huge grandstands the first time, McLaren led from Matich, who had Brabham close behind. Brabham swept past Matich on the back straight on the second lap, Stillwell and Youl changed places and Hulme moved past Patterson. Lap 3 saw the first of a long list of retirements when Charlie Smith (Elfin-Ford) and Tony Osborne (Cooper-Climax) retired with transmission troubles. Matich dropped from the running when his gearbox went out of order on the fourth lap on the back straight. Davison was now driving like a man possessed and was carving through the tail-enders with amazing rapidity. On lap eight he took Shelly and Patterson for eighth place. The leaders were now lapping the tail-enders and Stillwell outfoxed and passed Mayer, only to be repassed four laps later on lap 16. On the 14th lap, Shelly was in the pits when the cap from the fuel tank of his Lola came off and sprayed his back with volatile, blistering avgas. He changed his shirt and rejoined the fray. On lap 21, he spun in front of the leaders, who were just about to lap him at Shell corner. At this stage the order was McLaren, Brabham, Mayer, Stillwell, Hulme, Youl, Patterson and Davison and the rest of the field had been lapped at least once. Outbraking McLaren in Shell corner, Brabham passed on lap 24 only to have the lead snatched back on the back straight in the same lap. McLaren was really extending his car. Both were in extremely close company. Hulme now moved up a spot and was ahead of Stillwell who was lying fifth. Davison, who had been going very well and driving perfectly, retired with a seized engine on the back straight. Lap 31 saw a significant change when Brabham again outbraked McLaren into Shell corner, but no matter what the Cooper driver tried, he could not regain the lead on the back straight again. Both drivers were really motoring, with lap times in the 1:9s. The McLaren challenge disappeared on lap 39 when the engine gave up in the Cooper. Apparently a con-rod bolt broke while backing off for Peters corner, punching a fist-sized hole in the block. Brabham was now well in the lead with over 34 seconds on second placeman, Timmy Mayer. 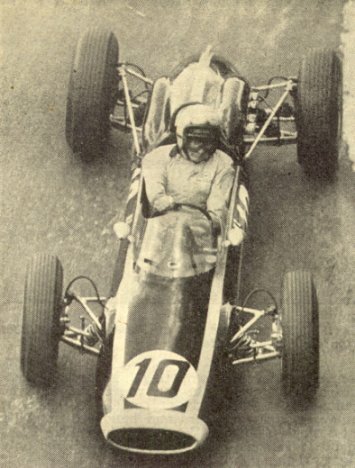 Jack Brabham then slowed to the 1:13s to allow his engine to rest to assure himself of first place. Brabham on his way to winning his third AGP victory. Patterson brought his car in on lap 36 with spark plug lead troubles. His co-driver, Whiteford, quickly solved the problem, jumped into the car and did a few circuits before finally pushing it under the safety railing at the tricky Peters corner. About 10 laps from the end, Mayer started to slow and Stillwell and Youl were fast catching him. The fuel relief valve on his auxiliary tanks apparently was not working properly and was starving the engine. Stillwell passed the American first and several laps later, Youl caught the spluttering Mayer Cooper in front of the grand stands. Behind these four came Hulme and Palmer, three laps down with Glass another three laps behind, but first in the under 1500cc division. The first race of the Australian section was tough. Only nine cars of the 24 starters finished, and although a good race some thought the second half to be quite boring once Bruce McLaren went out. 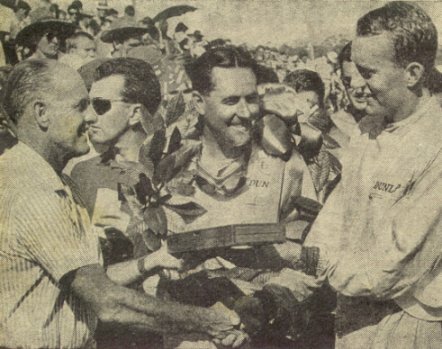 Jack Brabham accepted the chequered flag three times in Australia. Fastest Lap: Jack Brabham and Bruce McLaren 1:9:5 (99.83 mph). A week later, February 16th, the whole entourage appeared at Warwick Farm. The Sydney race of 100 miles was to be held on the tight 2.25 mile artificial circuit and practice began on Friday with most people getting ready on the track early. Jack Brabham was a notable absentee, he felt that it would be foolhardy to run his car, which was in tip-top shape, in an unofficial practice session and went swimming instead. Mayer and McLaren were looking a little worried after Brabham's win in Melbourne and were determined to get things going, as they had in New Zealand. McLaren at this stage was leading the Tasman Championship scoreboard with Hulme, Mayer and Brabham tagging along behind. During the two and a half hour session, McLaren's aircraft-type battery expired and while the pit crew looked for another, Mayer kept circulating. Both looked very fast and confident. Hulme appeared and took Jack's 1962 car around to familiarise himself with the circuit and to make sure everything was A1 with his engine, which had blown a head gasket at Sandown the week before. Graham Hill imported at great cost by Scuderia Veloce, was having his first drive in any sort of Brabham and settled in to lap quickly in the car, which had been severely modified since its last appearance at Warwick Farm with team boss McKay at the helm. 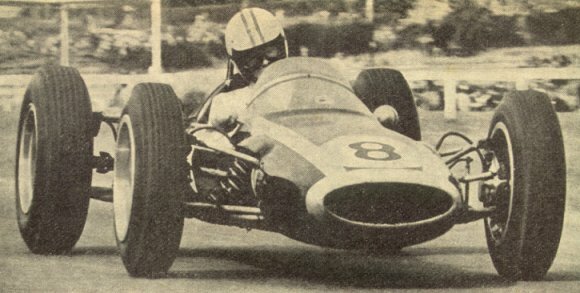 Graham Hill in his first ever drive in a Brabham. Using a long stroke motor for more torque, Bib Stillwell began in the 1:38s with poor handling. He and Hill also swapped front tyres to see whether the wider than normal 600 x 13 Dunlops the Scuderia was using were of any advantage. After quite a few laps both drivers decided that the narrower 550 section tyres were slightly better. 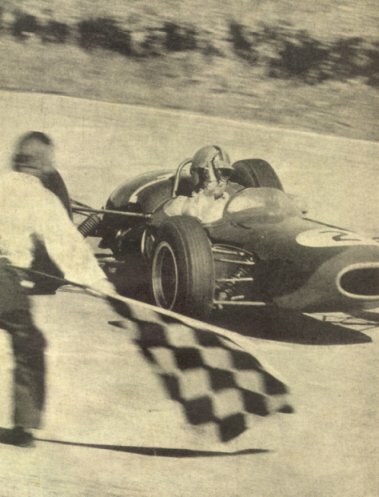 Hill rounded off the day with a 1:37 which left McKay beaming but a little disheartened when local boy Frank Matich hurled the Total Team Brabham around in 1:36:6, less than point two of a second behind Moss' unofficial record set during the same practice session for the 1962 race. The car sounded marvelous and Matich, who never seems to have an off day, his luck runs out first, was driving with a superbly calculated efficiency. Frank Matich on the Causeway at Warwick Farm. Youl was getting carburetor flutter and Lex Davison was grounding coming off the Northern crossing. 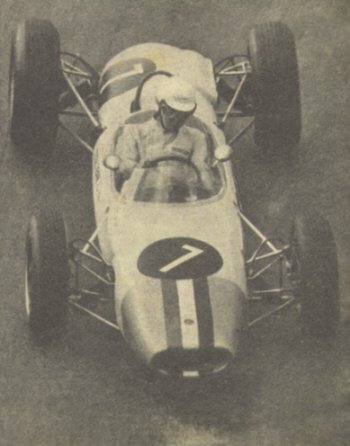 Palmer and Flowers (Lotus 20B), two of the touring trio of New Zealanders, practiced, but Tony Shelly arrived late and could not cross the circuit. Greg Cusack turned up with the rebuilt Brabham twin cam and was busily tracking down power problems, and Jack Hunnam (Elfin) had the misfortune to blow his clutch on the first lap of practice. In the Alex Mildren Brabham, Frank Gardner went out to potter around and Arnold Glass in the twin-cam Lotus 27 was settling in after being away from racing for so long. In 100 degree-plus heat on the tarmac, everybody turned out to practice on Saturday. Geoghegan put his pushrod-engined Lotus 27 away after doing 1:38:9 and Hunnam again had clutch problems. Shelly was having heat problems with his car, the forward part of the cockpit was so hot that his feet were being broiled. During the period between the sessions the weather became a little less stifling and consequently all except four drivers, all in the 1500cc division, bettered their times. Matich was the most impressive to record 1:37:0 to take pole position. Next to him was Hulme, who recorded the same time as Jack Brabham, who came next on the three car front row of the 3-2-3 grid. The layout was as follows :- Matich, Hulme and Brabham, then Hill and McLaren, then Mayer, Youl and Davison, then Stillwell and Geoghegan, then Gardner, Palmer and Cusack, then Shelly and Scott, then Walker, Hunnam and Smith, followed by Glass and Flowers at the rear. After a warm-up lap, Brabham made an almost perfect start and leapt into the first corner, while Matich stood still with his rear wheels smoking. Hulme stalled moments before the flag dropped and had to wait until the tumult had died away before he could be push-started. Hulme signaling that he has stalled and Matich full of wheel-spin. Lap one saw the black Lotus 27 of Arnold Glass on the pit apron with something out of action in the engine. The cause was finally traced to a burnt-out high tension lead in the distributor, then Frank Gardner in the Brabham made a stop to change fouled spark plugs. On the second lap the order was Brabham leading, Matich, Hill, McLaren, Mayer, Davison, Palmer, Geoghegan, Stillwell, Shelly, Cusack and Youl. Gardner made another pit stop to change another plug which was oiling up. Then on lap 4, as the leaders whistled into Creek corner, Matich in a beautiful piece of driving out-braked the twice world champion to take the lead. Further back Stillwell gathered in Palmer and Geoghegan, and Shelly moved into ninth slot. Lap 5 saw David Walker's Brabham wheeled away to its trailer when the gearbox expired. As Matich was going through Creek corner on the sixth lap something went wrong and he went spinning into the long grass. Brabham, McLaren, Mayer and Hill took advantage and snatched the lead with Matich rejoining the field in fifth spot. He retired on the 16th lap, however, with a fracture of one of the main front chassis members. Shelly was now settling in, in the Lola and passed Davison down Hume Straight for 7th place. On lap 22 McLaren and Mayer went under Hill who took a wide slow line through Polo corner and then McLaren closed up on Brabham, but could not get up enough urge to pass the wily Jack. Brabham was calm and collected and perfectly in command of the situation and McLaren was driving extremely hard to keep with him. Denny Hulme in the older Brabham. On lap 39 the crown wheel in Youl's Cooper gave up and he retired at the Esses. Scott (Lotus 27) was also out, with oil pressure failure. The race was then a high speed, on the limit, procession. With Brabham leading and keeping just far enough ahead of McLaren to stop any thoughts of him passing under braking or acceleration. As the two swept over the line to take the flag, McLaren was only half a second behind Jack who set a new record by running the race in 1 hr 13:45.1. After a conservative, precise, neat drive, with the odd fast lap thrown in to relieve the monotony, Brabham covered 66 laps of the lumpy 1.5 mile Lakeside circuit near Brisbane in 1hr 6:46.4s to win his third race in succession in the Australian half of the Tasman Series. On the Saturday practice things augured for a good race. The weather was fine and warm in the morning, although later in the afternoon, monsoonal rain, a Queensland feature at this time of the year, set the tricky 90mph track awash. From the start it was obvious that Frank Matich was going to be the man to beat, if his car did not break down. In his second practice session Matich did a little low flying to record 58.7sec on his sixth lap knocking off, unofficially, the year-old 59.8 record of John Youl, and putting himself on the front row of the grid. Timmy Mayer, the back-up man on the McLaren team, did not waste any time and recorded a 58.8 on his eighth lap during the third session. This was good enough to put him next to pole-man Matich on the 2-2-2 grid. A wet track during the last session, which began at 4:45pm, put a damper on any more fast laps but Tony Reynolds (Rennmax 1500) bettered his one lap time in an earlier session and David Walker (Brabham 1500) reached a respectable 1:4:2. 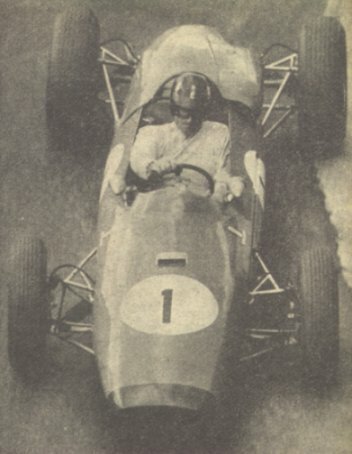 Arnold Glass, still sorting the twin-cam Lotus 27, also improved his time, getting down to 1:5:5, the same as his best in the Cooper-Maserati in 1961. 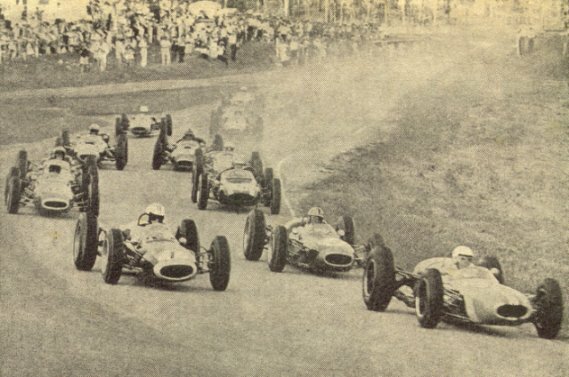 Race day was a little sunnier and in the first race, from which the small fry were selected to make up the field in the big race, Gardner, Cusack, Scott, Flowers, Glass, Ayers and Walker found themselves making it to the grid. The final configuration was as follows:- Matich and Mayer, Brabham and Youl, Cusack and Gardner, Hulme and McLaren, Shelly and Scott, Walker and Flowers, and Glass and Ayers at the rear. Matich showed terrific form and led off the grid into the Karussell followed by Mayer and Brabham. 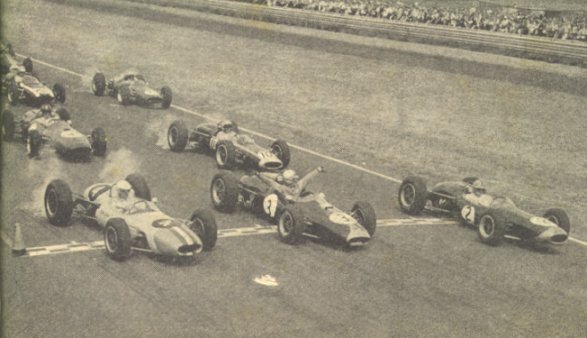 As they came past the racing pits on the first lap Matich had pulled out half a second from Mayer who was in turn half a second in front of Jack Brabham. On the second lap the order was Matich, Mayer, Brabham, Youl, McLaren, Gardner, Cusack and Shelly with the rest of the 1500s trailing along behind. The start: Matich leads Mayer, Brabham, Gardner, Youl, McLaren, Cusack and Hulme. As things began to settle down Matich and Mayer pulled out a little on Brabham. Then on lap 8 Matich's motor gulped a stone through the exposed Weber trumpets and bang, the motor was no more. A repeat of his NZGP troubles, a broken piston and a rod out the side. Officials push Matich's car aside after the blow-up. Mayer then took the lead and drew away from the rest of the field. In the same place as Matich, in front of the racing pits, on the 15th lap, there was a dull thud and Mayer's engine threw a rod. He coasted to a stop just past the start/finish line. Then Brabham took the lead and kept it through to the finish. He sat out front, serenely, and let the pack squabble behind him. On lap 17 Youl, McLaren and Hulme bunched up and kept close company until a few futile attempts showed McLaren it was unwise to pass. Youl drove superbly to hold off the foreign devils until lap 44, when Hulme and McLaren slipped through. The order was then Brabham, McLaren, Hulme and Youl. Twelve laps from the end McLaren and Hulme tangled at the Karussell and this let Youl past McLaren into third spot with Hulme second. 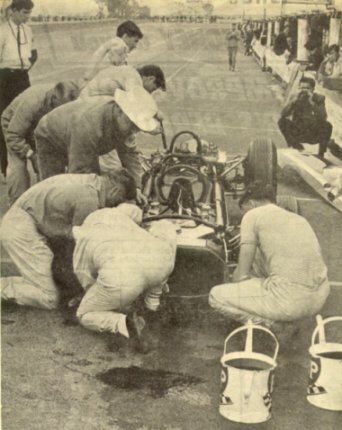 During the altercation Hulme knocked the valve on one of his front tyres and this caused his eventual retirement on lap 62. Youl was now in second spot, McLaren decided that a sure third was better than no place at all and finished without making a bid to wrest second place. John Youl receiving his trophy for second, Brabham looks on. Fastest Lap: Jack Brabham 58.7s (91.8mph). Following Lakeside everybody began the long trek south to Tasmania for the final round of the series at the fastest circuit of the eight, made up of public roads near Longford. Naturally Brabham was favourite after his three previous Australian wins, but even if he won the race he could not take off the Tasman Cup, as he had achieved maximum points for the Australian half in the first three races. McLaren, by finishing third at Lakeside, had clinched the title. The 4.5 mile Longford circuit is racing on real roads and as the sport is held there only once a year, the atmosphere is thick, wonderful and terribly healthy. After rush trips from Brisbane, everyone seemed to make the venue for the first practice session on the Friday. Matich, who had blown up in a big way at Lakeside, had his car flown from Sydney the night before. In the first session, which began at 1:30pm, Brabham did what was expected of him and recorded the quickest lap of 2:24:1. Matich came next in his identical car, but fitted with a low compression, twin plug, but single ignition, cylinder head engine with a 2:24:8. Timmy Mayer was third with a most creditable 2:25:9. Graham Hill at the Viaduct, Longford. Frank Matich at the same spot. After a brief respite to allow the sedan and slower sports cars to have a look at the track, the Internationals returned for their final period. Matich and Brabham recorded identical times of 2:23:5. Stillwell (Brabham) put in a flying lap of 2:25:0 and McLaren recorded 2:25:8. About midway through the session there was a tragic moment at Longford corner when young Mayer slewed into a tree after getting airborne over the hump off King's Bridge. Apparently Mayer landed askew with his brakes on, corrected the slide, but got two wheels on to the dirt, with the undertray rubbing on the bitumen edge. From then on, it is not quite clear what happened, but it is believed Mayer lost control and his car crashed at 110mph to hit a tree just behind the cockpit, near the forward engine bulkhead, and disintegrate. Mayer, who was flung from the car, died in an ambulance on the way to Launceston Hospital. So motor sport lost a charming and quiet young American who was destined to do big things as back-up man to Bruce McLaren in Formula One racing. Following the announcement of Mayer's death, and with the lowering of the American flag, the practice resumed with very few participants. Out of respect for his team-mate, McLaren announced that he would not practice any further and would not compete on the Saturday. On Saturday the organisers ran two 45-mile races for racing cars which virtually amounted to heats for the big, Monday race. Bib Stillwell won the first race from Graham Hill with Lex Davison third. Brabham dropped out while in the lead when he overshot the viaduct and stalled. Matich lead after Brabham dropped out but on the sixth lap soared the revs going past the pits to indicate a slipping clutch. he retired on the next lap. In the second race Brabham headed Stillwell over the line for first by three seconds with John Youl half a minute away in third place. The field for the second race was quite small as several drivers, including Hill and Matich, elected to work on their cars rather than start. The Sunday was a day of rest for everybody except the mechanics. Gerry Brown replaced the short-stroke motor Stillwell used in the Brabham for practice and the minor races on Saturday with a long stroke unit. New sealing rings were fitted to Shelly's Lola and Alan Ashton replaced a faulty magneto and a bent valve in Davison's Cooper. In the other camps activity was at fever pitch as preparation wandered on towards midnight. Bruce McLaren at the Viaduct. The final grid layout of 3-2-3 for Monday's race looked as follows:- Brabham, Hill and Matich, Stillwell and Davison, Youl, Patterson and Shelly, Palmer and Cusack, Glass, Gardner and Osborne, Hobden and Walker, and McLaren and McEwin at the rear. At flag drop the front line surged away and it was hard to tell who was really in the lead. The first time round, Brabham led from Hill with Stillwell third. Matich took Stillwell on the second lap and in the following laps the three leaders began pulling away from the field. McLaren after a little trouble passed Stillwell and set out after Matich whose engine was losing its crispness. On the ninth lap McLaren passed Matich on the main straight. Matich then tucked in behind the Kiwi expert for several laps to take advantage of the latter's tow which eased the stress on the Brabham's ailing motor. On lap 13, just past the halfway mark, the order was Brabham four seconds ahead of Hill, McLaren, Matich, then a 24 second gap to Stillwell, Davison, Youl, Shelly and the rest of the field. Nobody was in really close company. Gradually Matich was widening the gap on Stillwell, who was unaware of the misfiring troubles and the difficulty Matich was having with his engine. About lap 15 Stillwell got the message and began narrowing the 27 second gap between Matich and himself by a couple of seconds each lap. As the race wore on interest roused in the tussle that was on for fourth place. Stillwell began trying very hard and was making up more than four seconds per lap on the ailing Matich Brabham. On lap 22 Brabham didn't appear and Graham Hill was in the lead. On the climb out of Newry corner the crown wheel and pinion in Brabham's Hewland gearbox cried enough and he was out of the race. Hill lead from McLaren, who seemed to be picking up time, Matich and Stillwell, who was fast coming into the picture. On the last lap Matich put in everything he had to stay in front of Stillwell. Matich reached Mountford corner before Stillwell and as both accelerated towards the line it looked as though Stillwell might just pass Matich for third. However, Matich managed to get the nose of the Total Team Brabham across the line just in front of Bib. The official time showed less than a tenth of a second between the cars.